Just in time for the growing season. First off, a heartfelt thank you to everyone who made it out to the AVC (or followed it on the internet). Despite the unsavory weather, the turnout was great and the event was the best yet! We have about 50 GB of video and a few thousand photos to sort through. We'll be posting up a full recap with photo and video later this week. Today, we are going to be talking about a cool project from SparkFun customer Andrew Frueh - the GardenBot. If you're anything like me, gardening doesn't exactly come as second nature. My thumb is decidedly not green. This system, which Andrew has named GardenBot, is an entire gardening network that monitors your soil and creates charts that allow you to see the world the way your plants do. The entire system is built around "modules" - things like "The Brain," "Garden Station," and "Soil Moisture Sensor." Each module has a specific function, which allows you to build a custom system for your needs. You could potentially implement a "Soil Moisture Sensor" module with a "Water Valve" module and have your plants watered only when they need it. 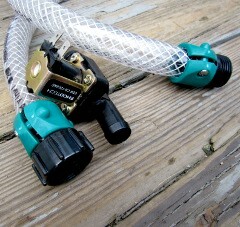 The Water Valve System module and the Light Sensor Module. There is a ton of information on the GardenBots website (Andrew has done a fantastic job of documentation) so if you are interested in designing your own system, the info is there. Great work Andrew! Very cool. I am working on a similar project but it will be running my hydropnic system, light controllers, water level and pH adjustments. quick writeup of my very basic working prototype. http://www.getoutsideandlive.com/2011/03/self-contained-aeroponics-prototype-system/. I'm waiting for a few solenoid valves to arrive and then I'll begin working on a central nutrient distribution system that will do ph, water level and nutrient measurements / adjustments. My favorite part is the ungrounded, non waterproofed 110V AC power turning on the water solenoid. What could go wrong? Andrew: For the love of god, switch to a low voltage isolated system with a ground fault isolator. The LAST thing you want is for someone to electrocute themselves with this. Other than that, it looks great! I love how well you documented each component. So technically this is just a big Botanicalls system but instead of constant plant complaints your plants can take care of themselves, And instead of a single houseplant it can monitor and respond to your entire lawn and landscaping. My mum has been hinting for me to build a system like this for her garden, she would LOVE. this. Any word on why your webserver was down for several hours yesterday (Sunday)? Sparkfun.com returned a 404 for a while, then came back but wouldn't load documents (spec sheets) for another few hours. I was on and off all day yesterday with no problems noted. Be careful with the light sensor, CDS cells do not stand up to moisture well. freeze/thaw = tiny crack = tiny bit of water inside = bad cell very quickly. So true! LEDs make better light sensors on the cheap. So LED better than a photo transistor? Not generally, but LEDs have more "flavors" and are cheaper. I have used high intensity LEDs without amplification. 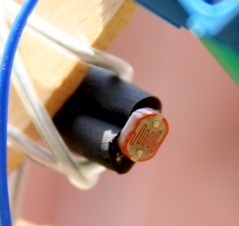 Standard LEDs require a basic OP-AMP. Could you give me an example of a high intensity LED part that works well for this purpose? Sorry if the web-page is a bit sparse, I've had too much on my plate working full time and developing the OS and teset platforms like the PygmyWEB. Anyhow, very cool topic. Oh, and anyone interested in getting in on development of the platform can e-mail at the address at the bottom of the page. Awesome, this is a top shelf idea, thanks! Nice work! California needs smarter watering systems. There's not enough water to waste. There is tons of water in California. The problem is that it's getting piped to Southern California. All along the Central Valley, you can see signs like this. So there's tons of water in California, just not enough for Southern California? What? Sorry, I didn't explain much since I didn't want to sound like some politician or conspiracy theorist. There is plenty of water from the North. In California, water is heavily privatized. Irrigation in Northern California turns up less profit than manufacturing and residential use in Southern California. Read this. I would say this is great for Nevada and Arizona though.